Winter is approaching, and with it comes snow and ice! 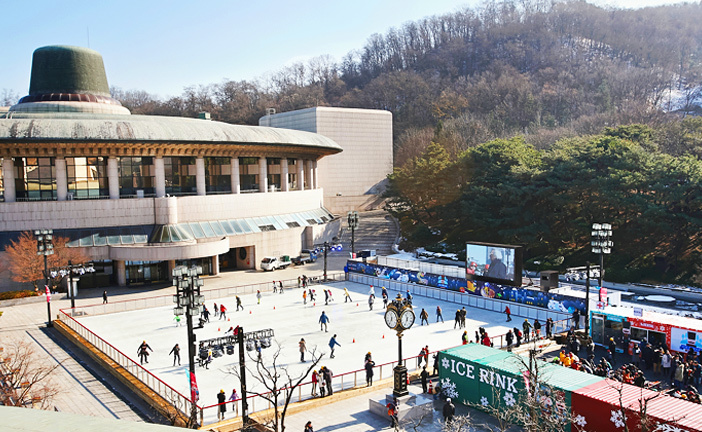 Korea's winter offers plenty of activities and opportunities to indulge in winter fun, namely ice skating and sledding! Ice skating and sledding are the most affordable and easily accessible winter leisure activities loved by people of all ages. The winter cold will be a distant memory as you zoom down snowy hilltops or glide gracefully across the ice. So brace the cold this winter and visit an ice skating rink or a sledding park to make some unforgettable winter memories in Korea! 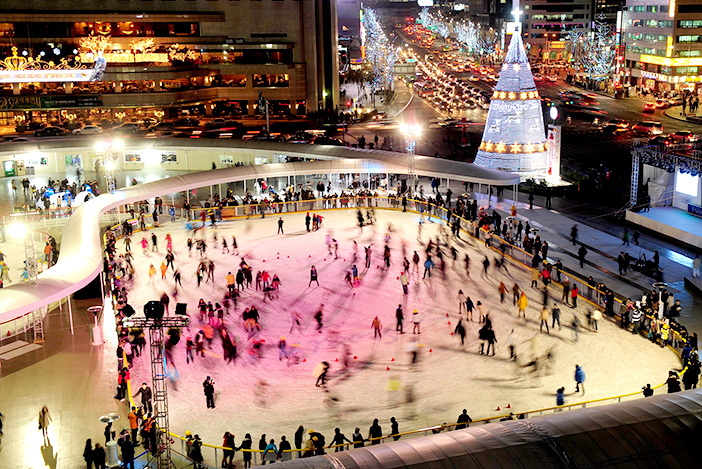 Filled with enthusiastic atmosphere and nestled among the tall skyscrapers, Seoul Plaza Skating Rink offers an opportunity to experience what it is like to skate within the city. The skating rink opens at 10 a.m., with ice resurfacing schedule every hour for 30 min. Tickets are sold on-site and covers admission as well as skating equipment rental, including ice skates, helmets, and knee pads. 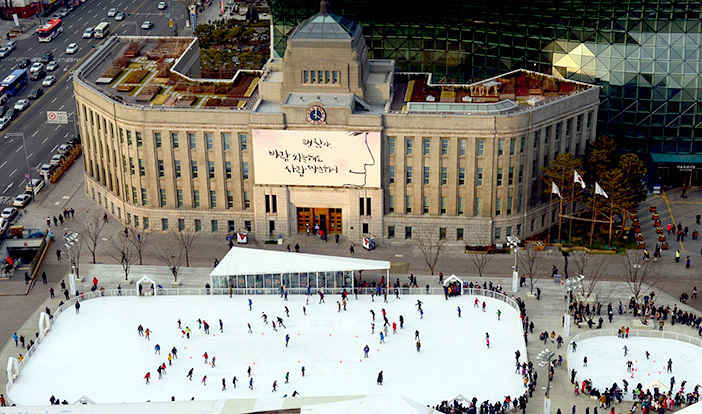 Not only is the admission fee affordable, Seoul Plaza Skating Rink is also one of the most convenient skating rinks found in Seoul due to its location at the center of the city, easily accessible via public transportation. It also has several attractions nearby, including Deoksugung Palace and Insa-dong. 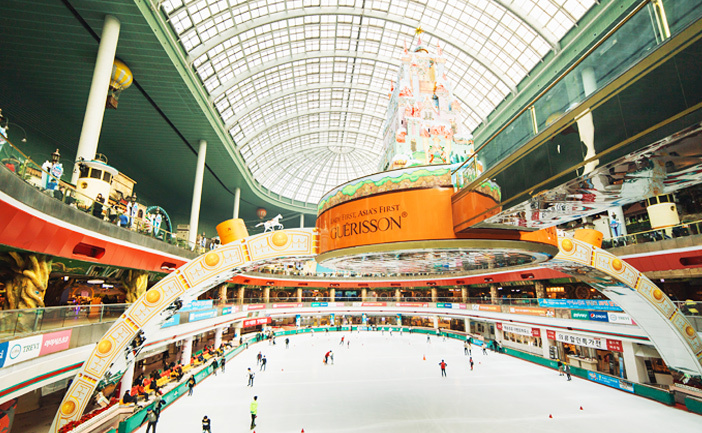 An indoor ice rink is located on the 3rd basement floor of Lotte World, one of the major amusement parks in Korea. The giant glass ceiling lets in natural sunlight, providing a refreshing atmosphere. At night, moving laser lights will make the ice rink come alive with a festive ambience. Around the ice rink are family restaurants and cafés where you can enjoy a nice cup of coffee or a pleasant dinner while enjoying the view of the rink. ☞ Directions: Jamsil Station (Seoul Subway Line 2, 8), Exit 4. Walk approx. 5 min. ※ Admission covers 3 hours, including ice resurfacing maintenance time. ※ Opening hours are subject to change in the case of private lessons. Check for updates online before visiting. ※ Admission of children of age 6 and under are not allowed due to safety reasons. The music square ice rink Ice Dream at Seoul Arts Center is equipped with stage lights and music, creating a mood for skaters to feel as if they are on a performance stage rather than a skating rink. Food trucks parked to the side sell delicious delights, including tteokbokki (spicy rice cakes), eomuk (fish cakes), and drinks, offering pleasure to your taste buds while you enjoy your time at the skating rink. ☞ Directions: Nambu Terminal Station (Seoul Subway Line 3), Exit 5. Walk approx. 10 min. Everland’s Snow Buster, located in Yongin, Gyeonggi-do, has a wide variety of high-speed sledding runs. There are three slopes according to difficulty: Jungfrau, Eiger, and Monch Kid's Sledge. Eiger, in particular, offers twice the exhilaration with its 200-meter curved slope. Eiger, as well as Jungfrau, is designed with individual lanes, guaranteeing barrier-free slide down at full speed. The lift tows riders back to the top of the run, giving a relaxing ride to the top of the hill while they sit comfortably on their tube sleds. Heaters are placed around the area for riders to warm up when needed. 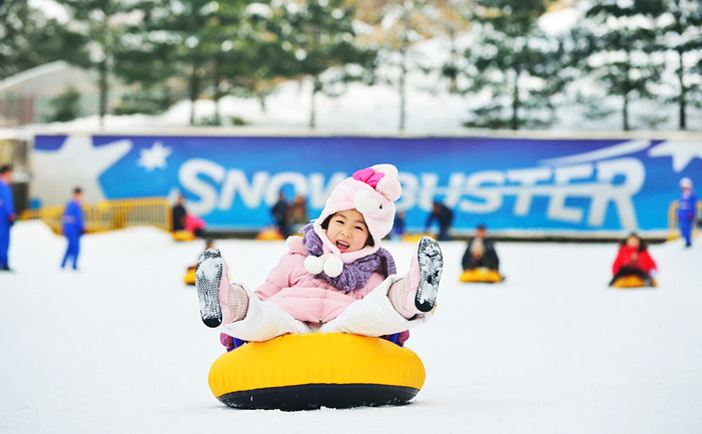 As the Everland one-day ticket covers admission and attractions, including Snow Buster, you may also want to enjoy the other exciting attractions at the amusement park after enjoying your sled ride. ☞ Directions: Everland Station (Yongin Ever Line), Exit 3. Take a shuttle bus at the platform in Parking Lot no. 5. ※ Height restrictions apply to children for safety reasons. 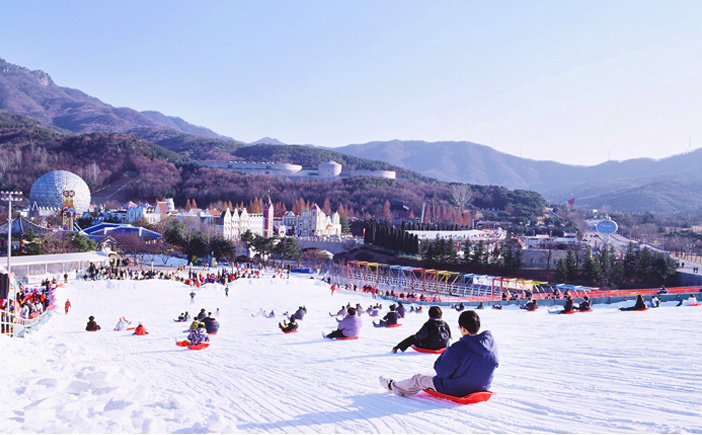 Snow Sledding Hills at Seoulland, located within close proximity of Seoul in Gwacheon, Gyeonggi-do, provides an ultimate experience for a family winter outing. The park’s concept focuses on the popular children cartoon characters from “Larva,” adding more fun to the exciting slide downhill. Safety measure is taken by preparing separate slopes for adults and children. At the playground adjacent to the slopes, you can enjoy other winter activities by making a snowman or engaging in a snowball fight. The playground also has a snow sledding area exclusively for toddlers and young children. The one-day pass for Seoulland covers admission and use of the sledding facilities, but the general admission ticket requires an additional 5,000 won (4,000 won for children) to use the facilities. ☞ Directions: Seoul Grand Park Station (Seoul Subway Line 4), Exit 2. Walk approx. 15 min. to main entrance ticket booth. - Directions: Mongchontoseong Station (Seoul Subway Line 8), Exit 1. Walk approx. 5 min. - Directions: Digital Media City Station (Seoul Subway Line 6, Airport Railroad, Gyeongui-Jungang Line), Exit 9. Walk approx. 10 min. - Directions: Omokgyo Station (Seoul Subway Line 5), Exit 3. Walk approx. 15 min. - Directions: Korea Univ. Station (Seoul Subway Line 6), Exit 3. From Korea Univ. Station Exit 3 Bus Stop, take Maeul Bus No. 20 to Korea University Ice Skating Rink Bus Stop. - Directions: Hangangjin Station (Seoul Subway Line 6), Exit 2. From Hangangjin Station, Blue Square Bus Stop, take Bus No. 405 to Hyatt Hotel Bus Stop. - Directions: Dongguk Univ. Station (Seoul Subway Line 3), Exit 6. From Dongguk Univ. Station, Jangchungdong Bus Stop, take Namsan Circulation Bus No. 02, 03, or 05 to National Theater of Korea Bus Stop and walk approx. 4 min. - Directions: Yeouido Station (Seoul Subway Line 5, 9), Exit 3. Walk approx. 10 min. - Directions: Ttukseom Park Station (Seoul Subway Line 7), Exit 2. Walk approx. 5 min. - Directions: Children’s Grand Park Station (Seoul Subway Line 7), Exit 2. Walk approx. 10 min. - Directions: Sanggal Station (Seoul Subway Line 1), Exit 3. From Sanggal Station Bus Stop, take Bus No. 37 to Korean Folk Village Bus Stop. ※ Gloves are required to enter skating rinks. ※ Opening periods and operating hours are subject to change depending on weather forecasts and unforeseen circumstances.